Today is the second instalment of your answers to the questions you put to the Department for Education last year. Yesterday, we brought you their replies to questions about SEND provision. So, here we go - leave comments on this blog, not Facebook please or the DfE won't see them. If you want to discuss these issues in depth, you can do so in our FB SNJ, Let's Talk about SEND group that's for anyone interested in meaningful discussion (not personal cases) about the issue. How is the Government ensuring that Education, Health and Care (EHC) plans are of good quality and that the voices of parents and young people are heard? Commissioning training programmes and regional events to enable local authorities to share good practice and join peer reviews. Parent representatives attend these sessions, and they now include health and social care representatives. Legal training workshops delivered jointly with IPSEA for education, health and care leaders with a focus on the requirements for EHC plan assessments and content. All the resources used or referenced in the workshops are available online at: http://www.sendpathfinder.co.uk/send-decision-making-and-the-law-workshops. A webinar has also been created providing an overview of the learning at the workshops, this resource can be found online at: http://www.sendpathfinder.co.uk/send-decision-making-and-the-law-webinar. The Department’s SEND Adviser team continues to provide feedback on the structure and content of EHC plans as part of their regular work with local authorities. They have also provided a similar service in relation to the transition process. 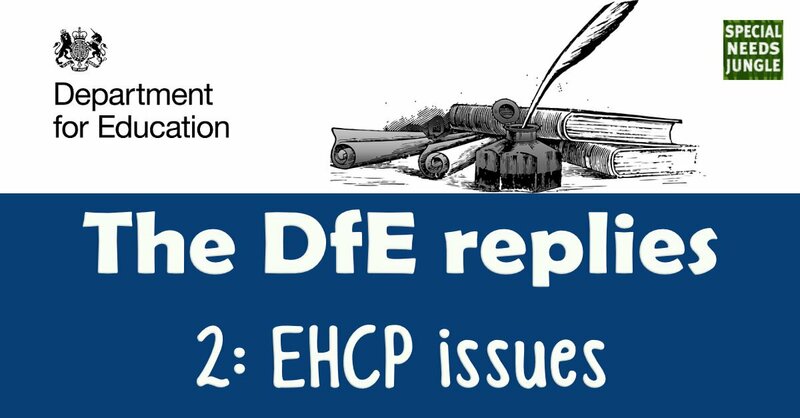 Where specific issues have been raised about a local authority’s EHC plan process or quality from, for example, the local Parent Carer Forum, they have also worked with that local authority. The Advisers also identify local authorities with some good practice around EHC plans and share this. What is the Government doing to promote personal budgets? The Department funded KIDS to produce Making it Personal 2, a suite of resources to inform professionals and parents about personal budgets. The resources can be found at: http://www.kids.org.uk/mip2. There were 6,442 personal budgets in place for EHC plans issued or reviewed during the 2016 calendar year. You can find out more about personal budgets from the SEND Guide for Parents and Carers: https://www.gov.uk/government/publications/send-guide-for-parents-and-carers. Page 25 deals with personal budgets. How does the Government provide funding for pupils with high needs to ensure their educational support is delivered? The SEND Code of Practice places clear responsibilities on schools to identify and address the needs of all their pupils with SEN and disabilities, including those with high-level needs. This includes meeting the costs of additional SEN support for all pupils up to £6,000. If a pupil requires additional support that costs more, then the school may speak to the local authority about receiving top-up funding from the authority’s high needs budget. If any school has a high proportion of pupils with high needs, the local authority can provide extra funding to the school, again from its high needs budget, so that the school can meet the extra costs involved in providing this support. These arrangements were introduced in 2013, partly to avoid what was happening in some areas: schools were labelling pupils as having high needs or persuading parents to seek a statutory assessment leading to a statement of SEN simply to secure extra funding for the school. We have published the full detail of the new school, high needs and central school services national funding formulae, and the impact they will have for every local authority. The introduction of the national funding formulae is supported by a significant extra investment of £1.3bn across 2018-19 and 2019-20, over and above the budget announced at the 2015 spending review. We are also committed to reforming the funding for children and young people with high needs. The additional investment we are putting in means that every local authority will see a minimum increase in high needs funding of 0.5% in 2018-19, and 1% in 2019-20. Underfunded local authorities will receive up to 3% per head gains a year for the next two years. Overall, local authorities will gain 4.6% on average on their high needs budgets. What is the Government doing about funding for SEND Transport? Local authorities must provide school transport for children of compulsory school age who cannot reasonably be expected to walk to school because of their mobility problems or because of health and safety issues related to their SEND. They have a duty to publish a transport policy statement each year, specifying the travel arrangements they will make for 16 to 18-year-olds (and those who started their programme of learning before their 19th birthday) to access further education and training. These arrangements do not have to be subsidised or free, but local authorities are expected to make reasonable decisions based on the needs of their population, the local transport infrastructure and the resources available. Local authorities have to provide free transport to adults aged 19 or over, including those with an Education, Health and Care (EHC) plan, if they have deemed it necessary to make arrangements for them. Local authorities are spending nearly £1bn each year to provide home to school transport, with around £600m of this being spent on transport for pupils with SEN. In light of the Inquiry recently held by the charity ‘Contact’ regarding transport for disabled children, the Secretary of State for Education has agreed to review the statutory guidance on school transport for children of compulsory school age to ensure it is clear. Contact has detailed information about transport on its website.